The Bible includes many names of God. What are these names, and what do they tell us about our great Creator God? How do they help us understand Him? What is God’s name? This question has been asked and pondered through the ages. When God appeared to Moses with instructions to go to Pharaoh, king of Egypt, to seek the release of the children of Israel from their Egyptian captivity, what did Moses ask Him? “Then Moses said to God, ‘Indeed, when I come to the children of Israel and say to them, “The God of your fathers has sent me to you,” and they say to me, “What is His name?” what shall I say to them?’” (Exodus 3:13). At that time God gave Moses one of His many names: “God said to Moses, ‘I AM WHO I AM.’ And He said, ‘Thus you shall say to the children of Israel, “I AM has sent me to you”’” (Exodus 3:14). Biblically, names carry meaning. Names describe qualities and characteristics of the person or being who bears the name. For instance, the Hebrew name Jacob (Genesis 25:26 ; Genesis 27:36) means “taking hold of the heel, supplanter, layer of snares,” according to Gesenius’ Hebrew-Chaldee Lexicon to the Old Testament. However, after Jacob wrestled all night and prevailed, God changed his name to Israel (Gesenius: “contender, soldier of God”) (Genesis 32:28). Therefore, in the Bible names reveal important information about the person or being. But what about the names of God? What do they reveal about Him—His nature, character, attributes, attitudes—His very being? God refers to Himself by many different names in the Bible, and with each name we learn more about Him. Often the first time one of His names is used in the Scriptures gives us insight into the quality or characteristic of God that He is revealing by that name. A brief look at three of the most common names for God is revealing. The first word translated as God in the Bible is found in Genesis 1:1: “In the beginning God created the heavens and the earth.” God here is from the Hebrew Elohim. It is the most-often-used Hebrew word translated as God in the Old Testament. It is translated as God well over 2,300 times. Elohim is revealed here as the Creator of the heavens and the earth. 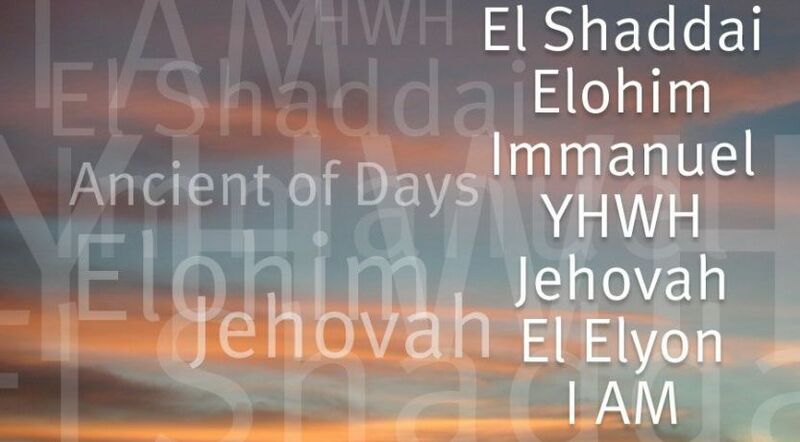 In the Bible there are many other names that God uses to call Himself. El is one example that is used in compound words such as in El Shaddai—God Almighty or the Almighty God (Genesis 17:1). El is often found in the names of individuals in the Bible—Samuel (Hebrew “his name is El”), Eleazar (“God has helped”), Immanuel (“God with us”) and many more. The most often used name for God is translated as LORD in the Old Testament. It occurs over 6,500 times. It consists of four Hebrew consonants, which have been represented in English in various transliterations: YHVH, JHVH, IHVH, JHWH and YHWH. These four consonants have been given a name—the tetragrammaton. YHWH was the Hebrew word that was considered too sacred to be spoken by the Jews. No one today knows exactly how it was to be pronounced. The Hebrew language consists of 22 consonants (most Bibles list these consonants in Psalm 119 as subheads over every eight verses). Vowel sounds are indicated by placing various dots or small lines around these consonants. The vowel points have been left off the tetragrammaton (YHWH). According to the Online Bible Hebrew Lexicon, the name is “unpronounced except with the vowel pointings of adonay.” Therefore, there is no accurate translation of this word into any language—Hebrew, English or otherwise. Commonly used pronunciations like Jehovah or Yahweh are just guesses. Some people go to great lengths to use only certain names for God or believe that He can only be addressed by a name in a specific language. God never required this, for He has many names and has called people speaking many languages. During His earthly ministry, Jesus likely spoke three languages: Hebrew, Greek and Aramaic. Yet He never instructed His disciples that God should only be addressed by a specific name in a specific language. In the Gospel of Matthew, which was preserved in the Greek language, Jesus taught us to pray to the Father (Matthew 6:9). Crying out to God just before His death, Jesus exclaimed “Eli, Eli, lama sabachthani?” which is Aramaic for “My God, My God, why have You forsaken Me?” (Matthew 27:46). God uses many names to refer to Himself for He has many qualities, characteristics, attributes, activities and traits that He wishes to reveal by His names. These are all qualities of His very nature that He wishes us to understand. In learning His names, we can come to know Him better. Does God Have Only One Sacred Name?